KICK-OFF: Sunday 18 August at 1:30pm. (GAMEWEEK 1) at Selhurst Park, South London. Roberto Soldado's 49th minute penalty proved the difference between Tottenham and Crystal Palace as they began their Premier League campaigns. Selhurst Park was provided with an electric atmosphere throughout the game, as the thousands of passionate Crystal Palace fans showed their support for the newly-promoted team and made themselves heard. Spurs gave away the ball early, when the ball was cleared away under no pressure at all, but nothing came from the possession. Crystal Palace had a very sturdy defense and this was on full display when Danny Rose and Jan Vertonghen were stringing together some play but they were bombarded with defenders. A strategy was quickly established from those at home, Crystal Palace were inviting Tottenham on, blocking them off then trying to attack on the break. However as the game progressed, that strategy seemed to wear off as Palace got in the game and it flowed. There were a few promising spots around the 20 minute mark, and to further show the progress, Tottenham looked like they were struggling under the pressure. 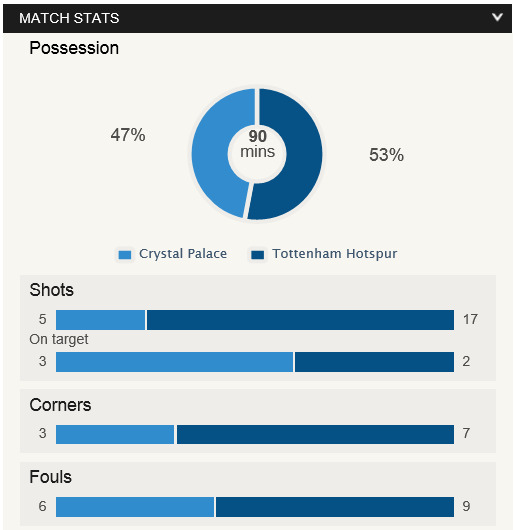 Tottenham were patiently waiting for the opening but Palace were not giving in. While both teams had their chances. The final 15 minutes of the first half was a good spell for Aaron Lennon who was causing some trouble for Crystal Palace - luckily the defenders crammed in to deny him. Julian Speroni played an influential part in keeping Crystal Palace even with Tottenham, making a great save when it could have been creeping into the goal just under the bar. As the first half drew to a close, Crystal Palace had a brief counter attack although nothing materialized. The final chance of the half came when Tottenham's Nacer Chadli headed towards goal but it went over the frame of the goal followed by the half time whistle being blown. The teams finished the first 45 minutes on even ground, Tottenham with more chances but Crystal Palace went in optimistic with the possibility of some counter attacks coming into fruition. The expectancy of Roberto Soldado had not yet been fulfilled, with just two mediocre chances that really had slim chances of being converted. Teammates Aaron Lennon and Kyle Walker have looked deadly on the flanks and also Danny Rose had a lot of contribution. Palace can be grateful that the final ball that would ultimately assist the goal had been poor. Keeping Palace in it in the first half was their defense, the numbers game gave them an edge to keep out Tottenham, but they were unable to go from defense to attack because the defense was prioritizedT too much. All even as the second half began. Crystal Palace and Tottenham Hotspurs started off the second half unchanged. Palace started off with a promising piece of play that was cut out promptly. A penalty was awarded to Tottenham in the 48th minute as they one claim for a penalty was denied, but when Aaron Lennon crossed the ball in, Moxey got in the way and it was declared a handball. Unlucky for Moxey considering his performance before the handball, but the risk of throwing himself at the ball had a consequence. Roberto Soldado stepped up, and scored. The Spaniard scored his first Premier League goal, that could be one of many to come. Well taken penalty placed nicely into the left bottom corner. Crystal Palace kept on working and they did not crumble as the fans in attendance were cheering on their revival attempt. Manager Ian Holloway further added to this with a triple substitution, introducing Williams, Phillips and Chamakh. This trio added a flare to Palace's game, with Phillips the fan favorite and the team looking revitalized. The Spurs' defenders were nowhere to be seen when Palace broke from the corner, it was a heart-in-the-mouth situation as Danny Rose and Dwight Gayle sprinted ferociously for the ball, with Rose prevailing after the referee called a foul - much to the disarray of Palace fans. Palace looked tired after that, and this allowed Soldado and Chadli to have a crack at goal, but they failed to double the lead. Shortly after, Hugo Lloris found himself making a terrific save to deny Crystal Palace yet again. Goalscorer Roberto Soldado was substituted in the 82nd minute in replacement for Jermain Defoe. After the fans were roaring during a Palace corner, Defoe had the ball and was racing away, but he was bombarded by defenders and it went out for a Spurs' throw-in. Maybe not the super-sub at that time, but then another substitute was introduced, as Younis Kaboul returned and gave Tottenham some height in defense to fight off Palace who were making a push. Defoe had another chance that skimmed wide a few minutes later. Crystal Palace came close in the 89th minute, but a double-save by Lloris maintained the lead, as part of a great performance in front of goal. They continued to push and push, but if they did manage to make it through the defense, Lloris would be the strong last barrier. There is no doubt in Crystal Palace's performance was promising and optimistic, but it may have been there first half performance that cost them, because they focused far too much on defense and not enough on attack. The fans at Selhurst Park were incredible during the game, providing an amazing atmosphere. This will definitely encourage them for the future, and I look forward to more games at Selhurst Park. TOTTENHAM FINALLY AHEAD OF ARSENAL, BUT IS MOMENTARILY? Tottenham are ahead of Arsenal... for now. But how will they fare in the future. They've picked up a big win to start the season. Tottenham's win without Gareth Bale could mark encouragement for Spurs' and the fans. The Bale saga may have dominated their pre-season, but winning in his absence due to injury is encouraging if Bale leaves, and if he doesn't, even better! Kevin Phillips received the best ovation from the fans, and he received a lot of encouragement. It is great to see him playing and hopefully he will be a cornerstone to their success. Soldado's performance before the Penalty was rather lackluster, but the penalty saved it for him. Who knows, had he missed, he would have been subject to much criticism. TRIO OF CHANGE: A little too late? Hollway's introduction of Chamakh, Phillips and Williams revitalized Palace, but it seemed a little too late. 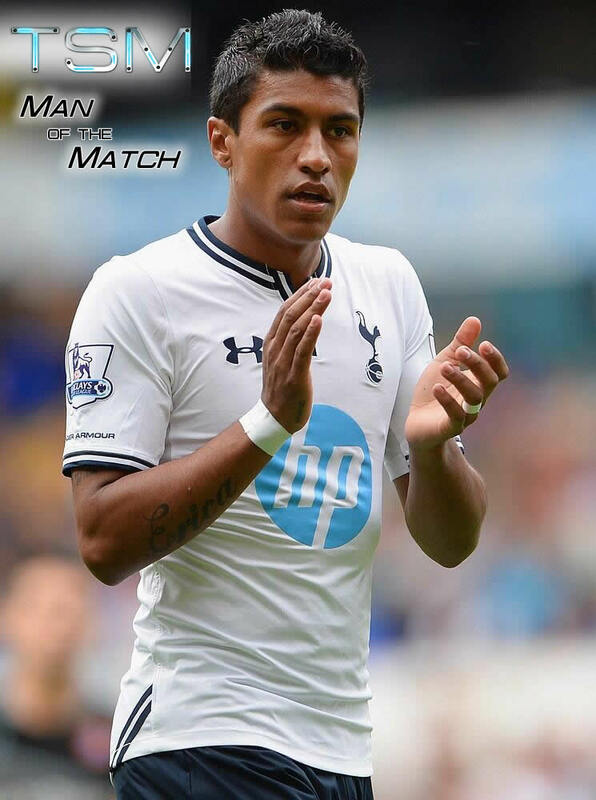 Paulinho - Man of the Match. Tottenham are made to work very hard for the win, but this performance by Crystal Palace is a lot to take towards the future. Soldado on the scoresheet on his debut which is more of things to come. A tough place to go is Selhurst Park, and they provided a great atmosphere. Unlucky for Palace to lose like that, but in the future, things are looking up. Soldado's penalty is the difference today, but more wins could becoming Palace's way. Coverage, analysis and more as part of this match report for Crystal Palace vs. Tottenham in the 2013/14 Barclays Premier League on Sunday 18 August, 2013.